The Focal Point police has booked seven members of a family, a contractor of Municipal Corporation and some officials of a nationalised bank allegedly for cheating a widow and trying to grab her share of property. A Punjab police DSP has ironically been posted as in charge of the Marital Disputes Cell, here, even though he is facing trial for demanding dowry and harassing his daughter-in-law. The Indian Oil Corporation has terminated the dealership of Arun Gas Service and made alternative arrangements for the consumers serviced by this agency. Consumers of various areas attached with this agency can get their LPG cylinders from the LPG distributors specified below. Unidentified scooterist looted Rs 1,600 from a liquor shop near bridge drain on the GT Road, 1km from here, at gun point. The local police has registered a case under Section 382-34, of the IPC on statement of Bhajan Singh. An elderly man was allegedly robbed of his belongings by a couple of child thieves at Clock Tower here yesterday. Nobody came to his rescue. A few people who gathered after he raised the alarm only tried to defend one of the boys whom the elderly man had caught. An FIR has been registered by the Kotwali police station. There are some traditional and creative art which should be preserved. The Punjab’s Phulkari, a handicraft of world fame, is one such casualty. Gone are the days when Phulkari used to be the first choice while decorating a house or giving a gift to someone, especially on marriages. The BJP has started reorienting its cadres and is approaching people with new issues. The party has adopted a comprehensive programme to launch a mass campaign in the urban areas to ensure that it is not caught napping during the Assembly elections. Scripted by the senior party leader, Mr Lala Lajpat Rai, Mr Satpal Gosain, the former Deputy Speaker of the Punjab Assembly, will be its poster boy. 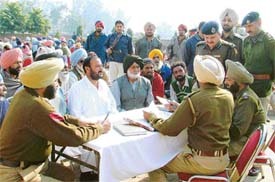 Minor conflicts as well as serious economic and social issues were galore at the three police-public meetings organised simultaneously at Mullanpur Dakha, Raikot and Jagraon town by the Jagraon police district here today. NRIs in Canada have joined hands to improve conditions in Punjab by forming a non-profit organisation, Helping Hands. The convener of the organisation, Dr Sanjiv Ahluwalia, an alumnus of Punjab Agricultural University, Ludhiana, and philanthropist, has been felicitated by the North American Wastewater Association for his contribution to the field of biological oxidation of organic pollutants in industrial effluents. Senior Vice-President of the Pradesh Youth Congress, Amarjit Singh Tikka today criticised the Shiromani Akali Dal (Amritsar) president, Mr Simranjit Singh Mann for his “provocative campaign” against senior Police officer and ADGP (intelligence), S.S. Virk. The Sahit Sabha Malerkotla organised a symposium on book ‘Sach Kahon’ by Dr Harkesh Singh Sidhu, Assistant Secretary Revenue at K M R D Jain College Malerkotla yesterday. Mr G K Singh Dhaliwal OSD to the Deputy Chief Minister Punjab presided over the symposium. Representatives of the trade and industry have reacted sharply to the White Paper on value-added tax (VAT), issued by the Union Finance Minister, Mr P. Chidambaram, in New Delhi, terming it an eyewash, aimed at misguiding the affected parties and creating more confusion. The State Bank of Patiala, Bharat Nagar Branch, took possession of the properties of two defaulters, who had not paid their dues. A team of officials led by the AGM, Mr M.R. Singla, and the Manager (Advances), Mr Jaspal Singh took possession of the properties of two defaulters, who had defaulted in repaying loans taken by them. The bank has taken action against these borrowers under the Securitisation Act, 2002. The two-day 10th India International Education Fair- ‘Education Worldwide India’ was inaugurated at DAV School here today. The education fair has been termed as Northern India Golden Crescent Tour, keeping in mind the potential of the city in Punjab. NSS volunteers of Guru Nanak Girls College celebrated the national youth week from January 10 to January 15 here. The week was celebrated to mark the birth anniversary of Swami Vivekanand. An interactive session on adolescence and its affiliated problems was conducted today by Dr Neelam Sodhi, a leading gynaecologist at Guru Teg Bahadur Hospital, at the Sacred Heart Senior Secondary School. Some of the issues discussed were related to the anxiety and stress faced by girl students. Students of Government Primary School, Akalgarh village, have been forced to drink water, which is alleged to have been contaminated, from a hand pump installed on its premises as there is no other source of potable water near the school. “Mere presence of fake seals on an electric meter does not prove that there was a dishonest abstraction of energy,” observed the Consumer Forum while quashing the demand of Rs 11,694 raised by the PSEB on theft charges. A mother’s nourishment during pregnancy is of vital importance for her and baby at all stages of foetal development. Research has shown that diet and healthy lifestyle are directly related to the baby’s weight at birth, his health in childhood and even after he has grown up. The International Sikh Dharam Parchar Manch will hold a free medical camp with the assistance of Gurdev Hospital at Grewal Market, Barewal Road, here tomorrow. Manpreet Singh was adjudged Mr Flex-2004 in the Fifth Ludhiana Open Bodybuilding Meet organised by the Flex Body Lines at Dugri here yesterday. 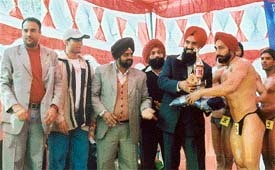 Gurdeep Singh was named the best poser. Hosts Kundan Vidya Mandir School, Civil Lines, had mixed luck as the boys won their encounter while girls went down on the opening day of the Ludhiana District Sahodhya Schools Complex Chess Tournament which began today. Mr S.J.S. Pall is the new Chief Commissioner, Income Tax, Ludhiana. He has been transferred from Allahabad in place of Ms Sudha Sharma who has been appointed Director-General (Investigation) at Chandigarh.